On April 3, 1922, Joseph Stalin took over control of the Communist Party of the Soviet Union and by 1927, he had absolute power over the USSR and was its unquestioned ruler. How did Stalin rise to power so quickly after Lenin's death and usurp all of his challengers? Stalin was one of the bloodiest tyrants in world history. He was the absolute ruler of the Soviet Union and later of the Communist bloc in Eastern Europe. He rose to this unprecedented level of power as a result of his capabilities and his understanding of the workings of the Communist Party. Stalin translated these strengths into total control of the Soviet Union after the Russian Civil War (1917-1920). Stalin was not the natural successor of Vladimir Lenin, but he was able to use his position within the Soviet Communist Party to become the undisputed leader of the Soviet Union. 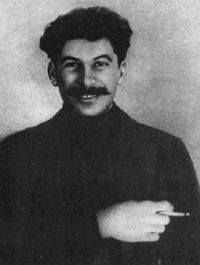 Joseph Stalin, the future leader of the Soviet Union, often referred to as the ‘Red Tsar,' was born on 18 December 1878 to a Georgian cobbler in Gori, Georgia and his wife in a small, impoverished village. His real name was Josef Besarionis de Jughashvili. He was ethnically Georgian, but Georgia was part of the Tsarist Russian Empire. After leaving school, Stalin went to a seminary. Instead of studying theology and the Bible, he embraced Marxism and became a follower of Vladimir Lenin, leader of the revolutionary Bolshevik Party. Stalin soon joined the Bolshevik movement and was very active in violent attacks on the Tsarist government. He was a notorious bank robber, and he committed these robberies to subvert the Tsarist government and fund the revolution. After being placed under surveillance by Russian secret police, the Ohrakan, for his activities, he went underground. He became one of the Bolsheviks' leaders in the Caucasus, organizing paramilitaries, and taking part in a terrorist campaign in the region. He was involved in the notorious Tiflis bank robbery where 40 people were killed. This robbery raised his standing among the Bolshevik leadership. However, Stalin made his reputation during the Russian Civil War. He was appointed as a Political Commissar to several Generals and ensured that they were loyal to the Bolsheviks. Eventually, he was given a military command and brutally suppressed White Counter-Revolutionaries and bandits. He was also instrumental in conquering his native Georgia, which had declared itself to be independent. Stalin was later appointed to the army in Ukraine, and he helped to push back a Polish invasion. However, he was criticized for not routing the Poles and exporting the revolution to that country and elsewhere in Europe. Historians have often argued that the Russian Civil War was won for the Bolsheviks by the revolutionary Leo Trotsky. This interpretation is now believed to be an exaggeration of Trotsky's role. However, Trotsky did play a significant role in the Soviet's victory over the White's in the Civil War and was a significant figure in the Communist PARTY and rivaled Lenin in prestige. Lenin was worried about the influence of Trotsky, and he employed Stalin to build up a base of support for him. Stalin did this but also at the same time, built up a body of supporters that were loyal to him in the Party. In 1921, Stalin was appointed to the position of General Secretary. This position gave him great power in the Party. Stalin created a network of supporters in the Party. Lenin became suspicious of Stalin and was beginning to mistrust his former protégée. In particular, Lenin disliked the brutal methods of Stalin in his native Georgia, where he brutally repressed those who opposed Bolshevism. Despite Lenin’s doubts, Stalin began to grow popular with the rank and file Party members. Unlike Lenin and Trotsky, he was not an intellectual and had the common touch, and he was well-liked by many. After the Revolution, Lenin held power in the new country. However, in 1922, after surgery, he had a stroke, and he was never the same. The stroke weakened Lenin, and many feared that he would not have long to live. Lenin was largely confined to a country retreat and cut off from politics. The ruling council of the Bolshevik Party, the Politburo, ordered Lenin to avoid and concentrate on his recovery. Stalin, the General Secretary of the Communist Party, was one of the few people who still had access to him. 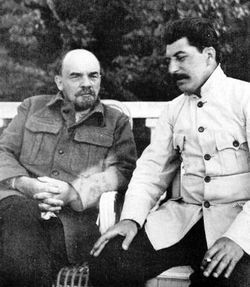 Stalin used his position to cut Lenin off from the party and effectively to isolate him. He knew that Lenin’s disliked him because Lenin perceived him as cruel and authoritarian. Stalin even berated Lenin's wife for breaching Politburo orders by helping Lenin communicate with others on public matters. Stalin's attack on his wife angered Lenin. As the relationship between Lenin and Stalin deteriorated, Lenin dictated his Testament. This Testament was, in effect, his analysis of the current Bolshevik Part, the future of the Revolution and an indictment of Stalin's character. In the Testament, Stalin was castigated and denounced as self-serving and focused only on amassing personal power. Lenin called for the removal of Stalin as General Secretary. Before Lenin could publish the Testament, he suffered a heart attack and was paralyzed. Stalin received the Testament from one of Lenin’s secretaries, who was his agent. Stalin repressed Lenin’s criticism of him. If the Testament had come to light Stalin’s career would have been finished. Allies of Stalin colluded to repress all mention of the document. Lenin died of a suspected stroke on January 21st, 1924. Stalin was given the honor of organizing the official funeral. He arranged the funeral and ignored Lenin’s final wishes. 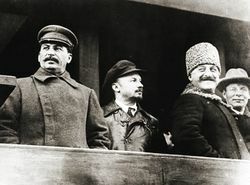 Stalin also gave an oration at the funeral, despite the opposition of Lenin’s window. Stalin under the rules of the Party was now the de-facto successor of Lenin. However, the party was not under his control, he had to share power with a collection of other Soviet leaders, including Trotsky, Zinoviev and Kamenev. Stalin was officially the leader of the Communist party, but to many in the Party, he was only a figurehead. Many dismissed him as a nonentity and a political figure of no real substance. Many prominent Bolsheviks had always underestimated Stalin because he was not well educated. Trotsky, Kamenev, and Zinoviev all saw themselves as the logical choice as the successor of Lenin. However, they were not as popular as they believed and that Stalin was very popular with the ordinary Party member. Stalin was shrewd enough not to appear to be seeking the leadership of the Party. Furthermore, Stalin publically denounced Kamenev and Zinoviev, when they tried to involve him in a conspiracy against Trotsky in 1925. Only Stalin and Trotsky as the sole contenders for the leadership role. The rivalry between Trotsky and Stalin was not only a personal because both men had radically different views on the nature of Communism. More importantly, they held antithetical ideas on the future of the worldwide Communist revolt. Influenced by Marx, the Bolsheviks, believed that there was going to be a world-wide Communist Revolution. Stalin began advocating "Socialism in One Country," which says that the Bolsheviks should focus building communism in the countries they already controlled rather than spreading the revolution. This view drew many like-minded Party members to Stalin, especially the rank and file. Stalin placed himself in ideological opposition to Trotsky. The Party accepted Stalin’s position, and this meant that Trotsky was increasingly marginalized. He then decided to organize public protests, along with others, against Stalin’s growing control of the Party. However, Stalin, employed a law passed by Lenin, ordering unity in the Party. Stalin asserted that Trotsky, was trying to split the party and this ploy managed to sideline Trotsky even further. Another factor, in the growing isolation of Leon Trotsky, despite his achievements during the Russian Civil War, was his Jewish heritage. There was a great deal of antisemitism in Russian, and this made Trotsky unpopular. By 1927, Stalin was so powerful that he could force Trotsky, Kamenev, and Zinoviev from the Politburo and later expelled from the Bolshevik Party. Trotsky was forced into exile and eventually later settled in Mexico. By 1927, Stalin was the unquestioned ruler of the Soviet Union. His had filled the administration of the Party with people who were loyal to him. Increasingly, Stalin appointed his loyalists to the Politburo. Many of Lenin’s former lieutenants realized that Stalin was making himself a de-facto dictator. Bukharin was something of a darling in the Party. He was handsome, charismatic and a favorite of Lenin. He led the opposition to Stalin in the Politburo. He opposed Stalin’s policy of the rapid industrialization of the Soviet Union and called for the gradual introduction of industrialization. Stalin prevailed, and later he had Bukharin expelled. All those who had crossed Stalin in some way were to be murdered on his orders. Some years later, Stalin sent an assassin to murder Trotsky. He was later killed by a Soviet Agent with an ice pick. Kamenev, Bukharin, and Zinoviev were all later put on trial, in a show trial and executed, on the trumped charges of plotting against the state. Lenin’s widow also died in suspicious circumstance, and many believed that she was poisoned on Stalin’s orders. 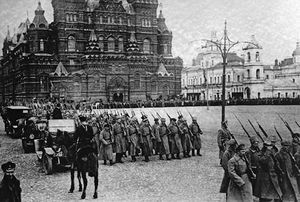 By 1928, Stalin was the undisputed ruler of the Soviet Union. In 1920, he managed to achieve this despite the opposition of Lenin and many of the senior leaders in the Party. He was widely seen as an uneducated peasant. However, he managed to turn this to his advantage and in his role as General Secretary, he built a power base in the country. Stalin was also generally popular among the ordinary Party Members, and this was crucial to his success. Stalin effectively built a powerful and influential following which allowed him gradually take total control of the Soviet Union. How did Vladimir Lenin Rise To Power? 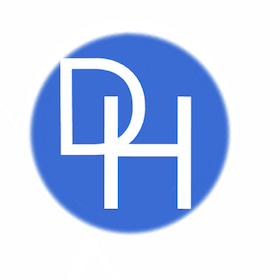 This page was last edited on 15 April 2019, at 22:21.